The clothing industry is the most sought out industry. The emergence of new fabrics and new trends has led to the growth of this industry, with big brands taking over the market, which has led to a lot of competition. 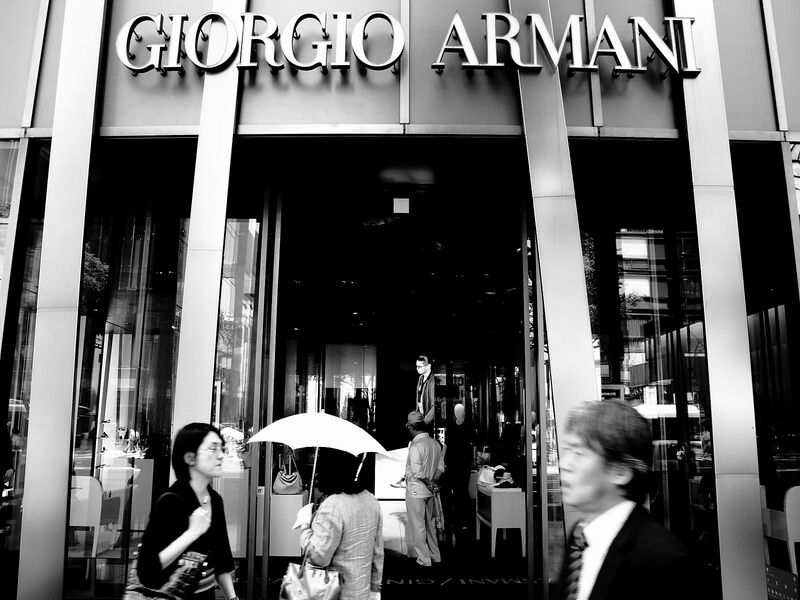 One of the most popular fashion brands is Armani. This is a famous Italian fashion brand created in the year 1975 by Giorgio Armani, who is one of the most respected designers, not only in Italy, but also all over the world. The top-notch fashion house manufactures, designs, distributes and retails high-end shoes, watches, jewelry, cosmetics, eyewear, and haute couture, just to name a few. This brand has expanded in the past, now consisting of several sub-brands as listed below. – This is the main line which is recognized best quality, highest prices, and classic designs. – This is the haute couture line, which mainly designs and manufactures red carpet gowns. – Mainly targets young adults, and is the most successful brand under Armani. – This brand is well known for tailored suits and also shirts. What is an Armani Exchange? This is a sub-branch under Giorgio Armani, which was introduced in the market in 1991. It caters for fashion lovers that love wearing street chic clothes. The clothes under this sub-branch are trendier and more colorful and are mostly cotton, with no added polyester. The clothes are also less expensive as compared to other Armani sub-brands. The sub-brand may, however, house other designers who produce items under the Armani brand. While Armani is a fashion brand on its own, Armani Exchange is a fashion sub-brand under Armani. Armani targets people of all ages. 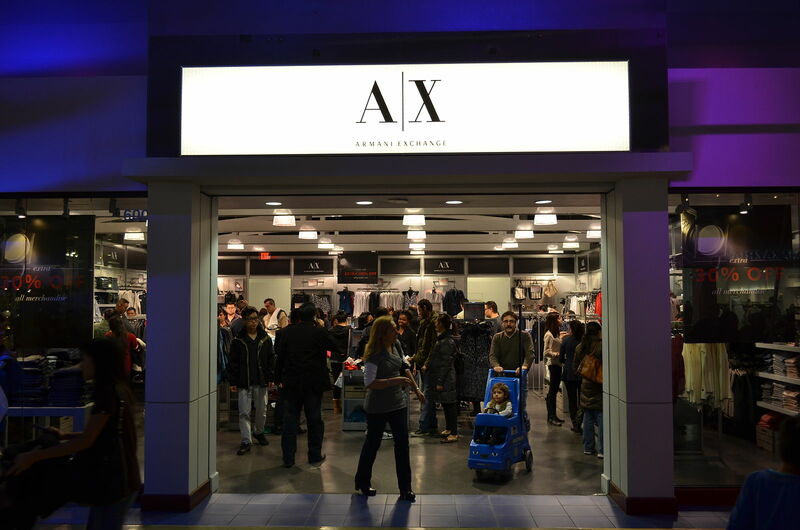 On the other hand, Armani Exchange targets street fashion lovers and teenagers. Armani contains all types of clothes. However, Armani Exchange contains casual wear and trendy clothes. Armani items are generally expensive. However, the sub-brand Armani Exchange has more affordable and less expensive items. It is the least expensive Armani sub-branch. While Armani was founded in the year 1975, Armani Exchange was founded in the year 1991. Designer fashion needs quality fabrics, clever craftsmanship, and unique items, which are offered by all Armani brands. Armani Exchange is especially ideal for teenagers and fashion street lovers, which is favored by the fact that it has the most affordable items in the Armani brands. Tabitha Njogu. "Difference Between Armani and Armani Exchange." DifferenceBetween.net. 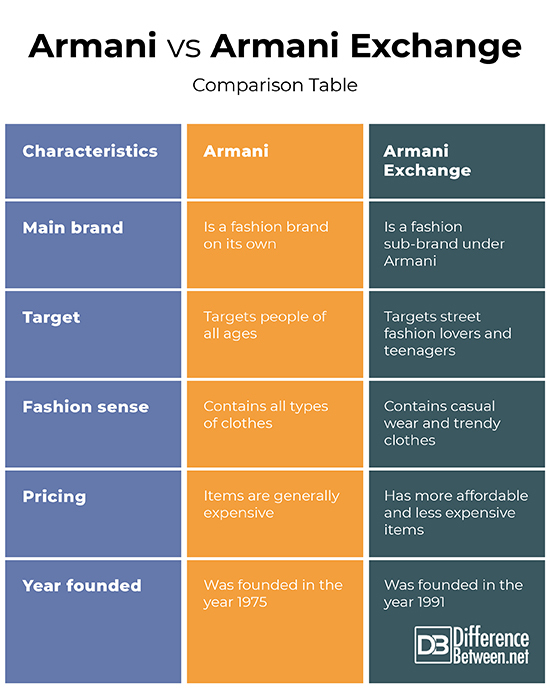 January 17, 2019 < http://www.differencebetween.net/business/difference-between-armani-and-armani-exchange/ >.